The main idea of this long article — stay conscious! — is so simple that it can be easily overlooked, especially since the mind (the thinking process) wants to overlook the main idea. The mind wants to believe that meditation is done with the mind — that meditation is the construction of some sort of thought or image — when in fact meditation is consciousness. I've reprinted this article from the Spring 2005 issue of Buddadharma: The Practitioner's Quarterly which in turn reprinted it from Wisdom Nectar: Dudjom Rinpoche’s Heart Advice translated by Ron Garry. The Tibetan text came from the twenty-five-volume Collected Works of H.H. 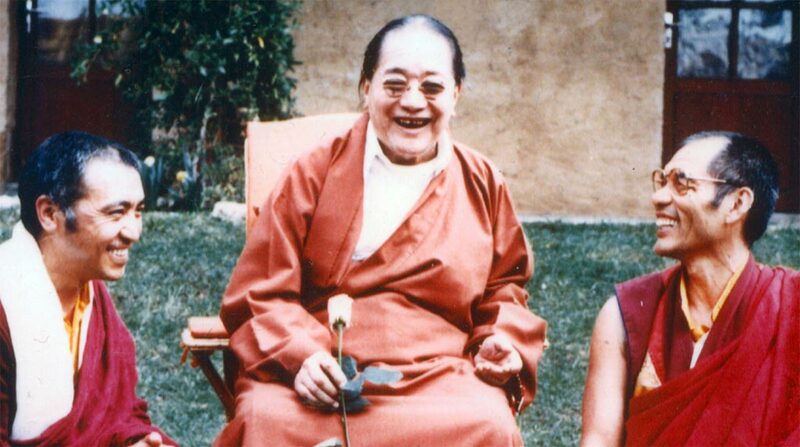 Dudjom Rinpoche. I've used the translator’s title for the article rather than the one used at the beginning of the text by the author. Essential Advice for Solitary Meditation Practice was written by Dudjom Rinpoché (1904-1987) at the behest of a retreatant, Rikzang Dorjé, in residence at Dudjom Rinpoché’s three-year retreat center, Ogmin Pema Ösel, in Tibet. This profound teaching contains within it the entire path of Great Perfection (Dzogchen), including how to prepare oneself for retreat, how to discern a proper location, as well as key instructions on view, meditation and conduct, including direct advice on how to bring your experiences onto the path. In three-year retreat, my teacher, Lama Tharchin Rinpoché — who was one of those fortunate retreatants for whom Dudjom Rinpoché wrote this text — would refer us to this text over and over again. It seemed that the answer to every question on meditation we posed would be found in Essential Advice for Solitary Meditation Practice. We all found this to be true, and it continues to be my treasured companion. The text is divided into three parts: Preparation, Main Practice and Post-meditation. What follows is the Main Practice section in its entirety, with brief excerpts from the Preparation and Post-meditation sections. DIRECT INSTRUCTIONS on practice explained in a manner easy to understand called Extracting the Very Essence of Accomplishment. I go for refuge and bow with devotion at the feet of my incomparably kind, glorious sublime lama. Grant your blessings to my followers and me that the profound path’s flawless realization arises swiftly in our mindstreams, and that we may then reach the unassailable state in this very life. In this text I present essential advice for solitary meditation practice in an easily accessible way. My words will place direct instructions for the practice of the innermost secret Great Perfection in the palm of the hands of fortunate individuals. Their previous lifetimes’ positive aspirations and pure karmic propensity have led them to feel heartfelt trust in the teaching of the profound, secret Great Perfection, and in the lama who reveals it; and they wish to take their practice to completion. For them, this text will provide an open gate to the path of Great Perfection. How to purify your mindstream: direct your mind toward the teachings after having severed all ties of attachment. How to directly cultivate the experience of Great Perfection: resolve any misconceptions regarding the view, meditation and conduct. How to keep your vows and samayas, and how to include all activities of this life within the dharma. Now I will say a little about the first topic. That which is called mind — this so very vivid awareness — appears from the very beginning at the same time as Buddha Always Noble, (Kuntu Zangpo). Nevertheless, Buddha Always Noble knew this awareness as his own. Alas! Sentient beings endlessly wander in samsara because they do not recognize this, taking rebirth in countless forms of the six types of beings. Everything they have done has been meaningless. Now, one time out of hundreds you have obtained a human form. If you do not do what you can now to avoid rebirth in the lower realms, your place of rebirth might be unknown, but wherever it might be among the six classes of beings, suffering will be its only sure feature. It is not enough to have just obtained this human form. You must at once practice the authentic Buddhist path since the time of your death is unpredictable. Furthermore, at death you should have no regrets and should not be ashamed of yourself, like Jetsun Milarepa. We live so as not to be ashamed with ourselves. When entering the Buddhist path, it is not sufficient to be a person who only adopts the outer appearance of a person on the path. Cut all entanglements to desirable things and to this life’s affairs. When you enter the gate to Buddhist practice without having cut these ties, you will lack determination, but not attachment to homeland, wealth, possessions, lovers, spouses, friends, relatives and so forth. Your attitude of attachment becomes an underlying cause; the objects of your attachment, catalysts. When these meet, negative forces will create obstacles. You will once again become an ordinary worldly person, and will turn away from creating positive karma. The common practices are the four thoughts that turn the mind away from samsara. The uncommon practices are taking refuge, generating bodhichitta, purifying obscurations and gathering the accumulations of merit and wisdom. Exert yourself according to each of their commentaries until experiences arise. Especially, embrace guru yoga as the vital essence of practice, and practice diligently. If you do not, your meditation will grow slowly, and even if it grows a little, obstacles will arise and genuine realization will not manifest in your mindstream. Therefore, forcefully pray with uncontrived devotion. At some time the realization of wisdom mind will be transmitted to your mindstream, and an extraordinary realization that can not be expressed by words will definitely arise from within yourself. Other spiritual teachings regard the main practice as being profound. We regard the preliminary practice as being profound. It is just as he said. The main practice is to cut through misconceptions regarding the view, meditation and conduct, and how to put our practice to the test. To begin, the view is recognition of ultimate reality as it is. As for this view, your mind’s nature is the ultimate nature of reality. Once you have concluded this with certainty in awareness free from all characteristics of intellectual mind’s fabrications and contrivance, awareness nakedly manifests as self-originating primordial wisdom. Words cannot express it. Metaphors cannot illustrate it. It does not get worse in samsara, nor better in enlightenment. It has not been born, nor will it come to an end. It has not been liberated, nor deluded. It does not exist, nor not exist. Awareness is unlimited and impartial. In short, from the very beginning, awareness has never been established as being material and having characteristics that can be conceptualized, because its essence is primordially pure, sublime, all-pervasive emptiness. The ocean of realms of phenomena of existence and enlightenment naturally manifest as the display of unobstructed emptiness, like the sun and its rays. Therefore awareness is neither partial nor a completely empty void, because its nature is the supreme spontaneous presence of primordial wisdom and noble qualities. Thus, awareness, the indivisibility of appearance and emptiness, epitome of the three kayas, is the primordial nature of reality. Precise recognition of awareness, ultimate reality as it is, is what is called the Great Perfection’s view beyond the intellect. The dharmakaya, beyond the intellect, is ultimate reality. We actually hold in our hands the wisdom mind of Buddha Always Noble (Kuntu Zangpo). How wonderful! This is the very essence of the six million, four hundred thousand Great Perfection tantras, themselves the consummation of all eighty-four thousand divisions of the Victorious One’s collection of teachings. There is nothing beyond this. You should resolve all phenomena in this awareness. Definitively conclude that all phenomena are contained with this awareness. Now, once you have resolved all your inner doubts and misconceptions regarding this view, to sustain its continuity is called meditation. All other meditations with reference points are conceptual meditations fabricated by the mind. This is not how we meditate. Do not lose hold of this view previously described, and in that state release all consciousnesses of the five senses within the natural state, and rest at ease. Do not meditate to arrive at a conclusion, “That’s it!” If you meditate in that way, it becomes intellectual activity. Here, there is no object of meditation whatsoever, nor even an instant of distraction. Distraction from resting in awareness is true delusion. Don’t be distracted! Whatever thoughts arise, let them arise. Do not follow after them and do not suppress them. If you ask “In that case, what should I do?,” whatever objective phenomena arise, whatever appears, do not grasp phenomena’s appearing aspect as you rest in a fresh state, like a small child looking inside a temple. When all phenomena are left as they are, their appearance is not modified, their color does not change, and their brilliance does not diminish. If you do not spoil phenomena with clinging and grasping thoughts, appearances and awareness will nakedly manifest as empty and luminous primordial wisdom. However, many teachings considered very deep or extremely vast have left individuals of lesser intelligence mystified. If I put my finger on the concise essential meaning, it is this: in the gap between the last thought’s cessation and the next’s arising, isn’t there a fresh, present knowing, that has not been modified even in the slightest — luminous, naked awareness? That itself is awareness’ abiding state! But one does not permanently abide within the nature of reality. Doesn’t a thought suddenly arise? That is the natural display of awareness. However, if you do not recognize thoughts as soon as they arise, they will naturally spread. This is called “the chain of delusion,” the root of samsara. Mere recognition of thoughts as they arise breaks their flow. Release thoughts within that recognition. When you remain in that state, arising thoughts will all be liberated equally within awareness, the expanse of dharmakaya. This is the main practice in which the view and meditation of Cutting Through Solidity, Trekchö, are cultivated as one. Is like finding a jewel at the bottom of the ocean. This is dharmakaya, not fabricated nor created by anyone. Persevere in this way. You must meditate without distraction day and night — do not leave emptiness in the domain of mere understanding. Bring everything back to awareness itself. Now I will describe how conduct can enhance meditation and how to put our practice to the test. The main point, as I previously explained, is to never part for an instant from the perception of your spiritual master as a true buddha; make heartfelt, intensely focused prayers to your spiritual master. This is known as “devotion that is the sole sufficient cure,” superior to any other method to remove obstacles and enhance your practice. You will forcefully and decisively travel all paths to enlightenment. If you experience dullness and drowiness, arouse awareness. If you experience excitement and agitation, relax your mind. Always, the meditator’s vivid mindful awareness should not impose a disciplined mindfulness. Mindfulness is simple recollection of the recognition of your own nature. Continuously sustain vivid mindful awareness at all times as you go about your daily activities, whether eating, sleeping, moving or sitting, whether during meditation or post-meditation. Never harbor hope or fear toward whatever thoughts arise, such as those of happiness or suffering, or of the passions; do not accept or reject them; and do not destroy them using antidotes, and so forth. Instead, whatever feelings of happiness and suffering are there, settle in their naked, vivid, lucidly present essence. This single vital point, and none other, applies to everything. Do not confuse yourself with a lot of thinking. A separate meditation upon emptiness as an antidote to what must be relinquished — thoughts and passions — is unnecessary. Awareness of what must be relinquished liberates it naturally with that recognition, like a snake’s knot uncoiling. Most people know how to say the words “the ultimate concealed meaning of the Clear Light Vajra Essence,” like a parrot’s chatter, but don’t know how to practice it. We are all so incredibly fortunate! Carefully consider this once again — there’s something to be understood. During our beginningless series of lives until now, our mortal enemy, dualistic clinging, binds us to the wheel of life. Now, thanks to our spiritual master’s kindness, his introduction to naturally abiding dharmakaya releases both poles of grasping, like a feather consumed in fire, with nothing following and without a trace. Isn’t that really satisfying? If you do not practice once you’ve obtained the swift path’s profound instructions such as these, it is as if a wish-fulfilling jewel were placed in a corpse’s mouth. What a waste! Practice without being discouraged! Furthermore, beginners will lose their mindfulness in distraction due to unwholesome thoughts that get out of control; these thoughts coalesce in the form of underlying mental activity. At some point, a piercing mindfulness returns, and the thought of regret arises, “Oh, I’m distracted!” Nevertheless, do not do anything whatsoever at that moment, such as stopping the flow of previous thoughts or regretting having been distracted. When this vivid mindfulness returns, it is sufficient just to sustain naturally resting in precisely that mindfulness. A famous saying advises, “Do not reject thoughts; see them as dharmakaya.” However, until you perfect higher insight’s subtle power, you might dwell upon the thought, “This is probably dharmakaya!”; and remain in a blank state of peaceful abiding. You thus risk getting trapped in a spaced-out, indifferent, unreflective state. Therefore, in the beginning look directly at whatever thoughts arise; do not examine, analyze or reflect upon them at all. Rest upon the recognizer of thoughts, without making it a big deal, disinterested in what arises, like an old man watching children at play. Once you’ve placed your mind as I described, the deepening of the experience of stillness in a non-conceptual natural state will be suddenly, abruptly destroyed. At that instant, primordial wisdom beyond mind will nakedly and clearly manifest. While you tread the path, this experience of primordial wisdom will not come untainted with one or another of three meditative experiences — bliss, clarity or conceptionlessness. Nevertheless, placing your mind without the slightest bit of hope, fear, attachment or conceit, due to holding such experiences as supreme, prevents errors. It is very important to constantly give up distraction and to meditate with one-pointed vigilant mindfulness. When you lapse into sporatic practice and mere intellectual understanding, arrogance will arise out of just a little peaceful abiding. If you do not carefully observe your spiritual experiences, you will merely be skilled in pretense and knowledgeable of the right words, which is not beneficial. As this says, even some slight positive and negative objective event has deceived great meditators, and many lose their bearings in the midst of circumstances. Even when meditation is planted within your stream of being, the profound instructions will be left on your book’s pages if you do not meditate consistently — your mind will become insensitive: you will become insensitive to the teachings, you will become insensitive to practice, and genuine meditation will never arise. Even old great meditators are in danger of dying completely lost, in the state of a newcomer to practice. Therefore, be very careful. When you continually familiarize yourself with this over a long period of time, devotion or some other suitable catalyst will at some point cause these spiritual experiences to overflow into realization, and you will vividly see naked awareness, as if a veil were instantly lifted from your head. You will become utterly free and spacious. This is called “the supreme seeing that does not see anything.” Thereafter, thoughts arise as meditation; mental stillness and movement are simultaneously liberated. Moreover, at first, recognition of thoughts liberates them, like meeting someone familiar. In the middle period, thoughts are liberated by themselves, like a snake’s knot uncoiling. Finally, thoughts are liberated without benefit or harm, like a thief entering an empty house. These three ways of liberation will occur gradually. A deep, decisive trust manifests within you that all phenomena are the magical display of your awareness alone — waves of realization of emptiness and compassion will surge. Choosing between either cyclic existence or enlightenment ends. You realize that buddhas are not “good” and sentient beings are not “bad.” Whatever you have done, you will be carefree beyond words without knowing how to move from the sole nature of phenomena, and therefore you will uninterruptedly abide in this infinite space, day and night. Like the sky, realization is changeless. This kind of Great Perfection practitioner appears to have an ordinary human form, but his or her mind is dharmakaya. He or she abides in wisdom mind free from effort and activity and, without doing anything, traverses all paths and stages. Finally, ordinary mind and phenomena exhausted, like the space of a broken vase, the body vanishes into atoms, and the mind vanishes into the nature of phenomena. This is called attaining the youthful vase body, which is the inner clarity of the original ground, stainless space. This will come about. Since this is the ultimate consummation of view, meditation and conduct, it is called “the fully manifest unattainable result.” The stages of spiritual experiences and realization arise either in a progressive order, without a progressive order, or all at once. This occurs according to the particular faculties of people, but there is no difference when the result is achieved. How the teachings encompass keeping vows and tantric commitments, and applying them in your daily life. Although you applied yourself in the practice of the view, meditation and conduct as described above, if you were unskillful in post-meditation’s conduct, and your vows and tantric commitments were damaged, impediments and obstacles will hinder your progress on the paths and spiritual stages in the short term, and ultimately you will certainly fall to the lowest hell called Incessant Pain. Therefore, it is extremely important to never be separate from vigilant mindfulness, not making any mistakes regarding the kind of conduct to accept and which to reject. Dudjom Jigdral Yeshe Dorje (1904 – 1987), the second Dudjom Rinpoche, was the head of the Nyingma lineage of Tibetan Buddhism. Ron Garry has a Ph.D. in Indo-Tibetan Buddhism and is translator of The Teacher-Student Relationship. Excerpted from Wisdom Nectar: Dudjom Rinpoche’s Heart Advice translated by Ron Garry.